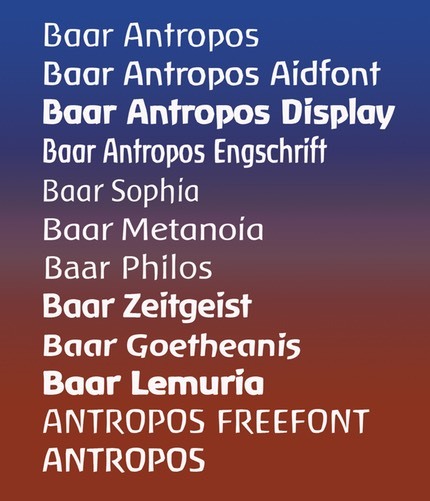 Baar aidfonts are now free fonts for private, cultural and commercial use! All fonts by Lutz Baar shown here are free to download and and use for all publishing purposes. You can even offer my fonts for free downloading from your own site. But you are not allowed to charge for them, not for modified fonts either. Some of these fonts seem to have a barrier build in when using in commercial programs - you are allowed to remove this barrier if you have the skills to do so (sorry, I do not have them anymore) or you can look for a download site with a ”cracked” font version. However, you cannot download any font from this site, you have to google the net for sites like fontspace.com and others which offer my fonts for free downloading - and these are the new terms: You do not need to ask my permission for commercial use anymore. Have fun! Lutz Baar, font designer, June 2018. Sorry, I can’t give you any support on installation etc concerning my fonts. However, here is my e-mail . My commercial fonts are part of the Linotype Library.